The rain, which started with a few tinks pinging on the tin roof early this morning and worked up to a real downpour, had stopped. The sounds of John Denver’s Country Road drifted in the air. It was the only sound coming from our usually bustling street. There were no tuk tuks, the shops across the road, usually open and lively, were closed and the motor mechanic workshop was shut up and deserted. Twenty Street had never looked so sparse. Even the dogs were quiet. Today is the last day of Phchum Ben – the biggest religious festival in Cambodia – and it is a public holiday. 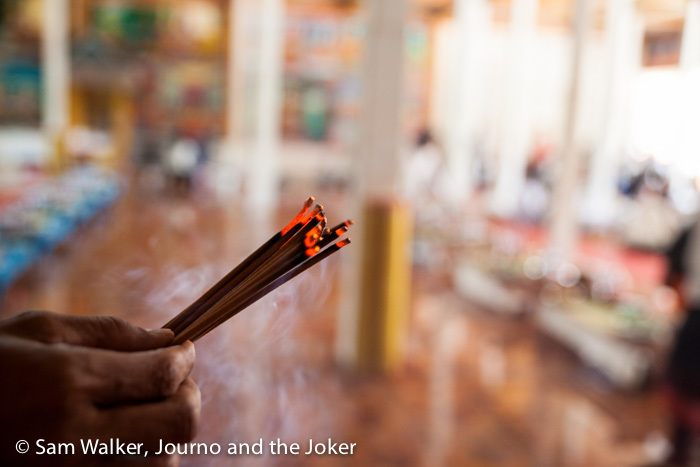 Many families were visiting the pagodas, offering their thanks and feeding the hungry ghosts. Others had gone back to their homeland or were relaxing with families. Phchum Ben is believed to be unique to Cambodia. It is a celebration honouring the ancestors and during Phchum Ben people visit the pagodas (temples) to offer food and drink to the dead. Money is also handed over. 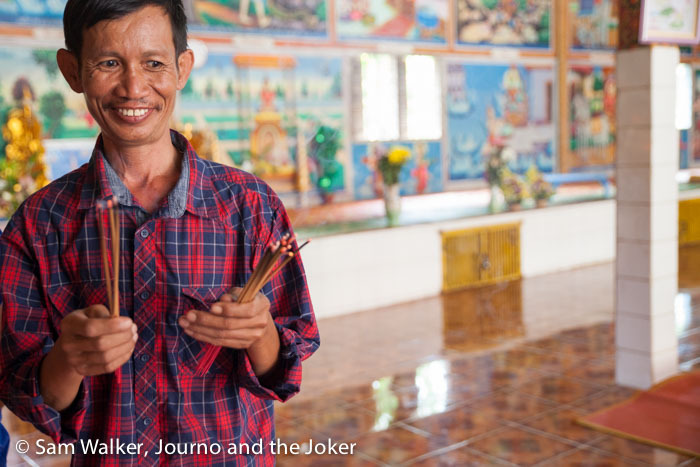 The Khmer’s believe that during this period the spirits come to receive offerings from their living relatives. Many families will visit multiple pagodas during this period to ensure their ancestors can find the offerings they have provided. Being able to take part in this festival with Khmer people was a wonderful experience. I went with friends from Two Dragons – Khmer and western – to Wat Preah An Kau Sau, a pagoda close to here. 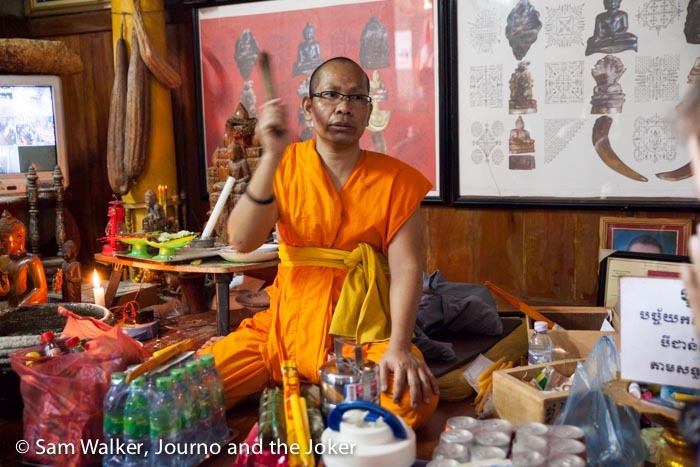 It started when food was presented to this monk – yes, that is a television in the corner – and money was put in the offering box. I believe the food was then blessed and holy water was flicked over it, but this part wasn’t explained to me. After this the food was taken to a communal area and handed over. 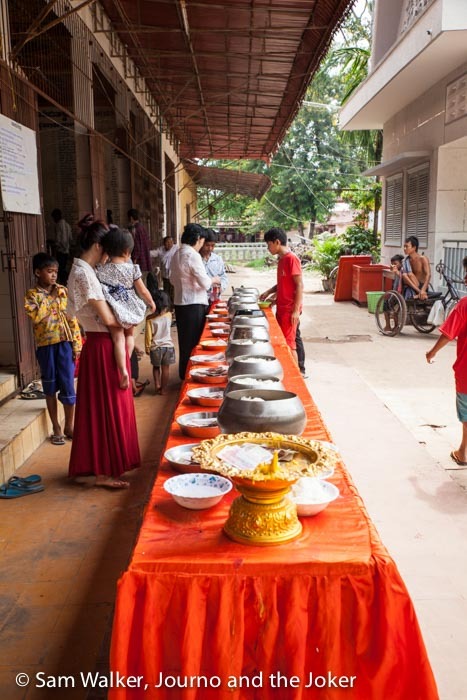 We were given a bowl of rice and had to take a small quantity of rice from the bowl and put it in each of the large bowls on this table, first putting money in the gold bowl at the top. Then we entered the large pagoda area, where people pray and light incense. The lovely Solly was showing us what to do each step of the way. At 11am the monks entered the pagoda and were seated at tables lined up. 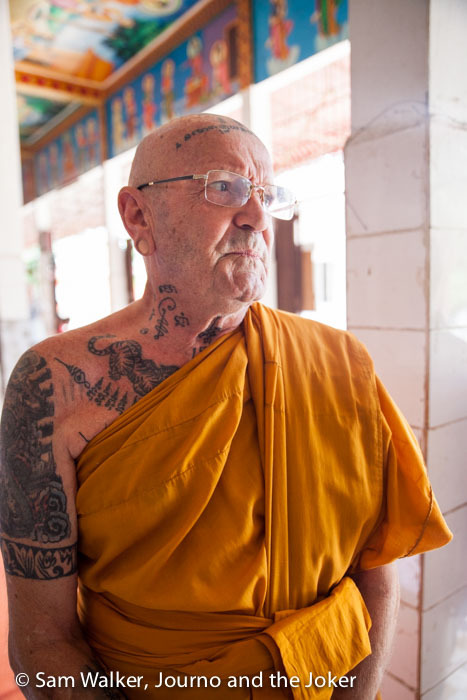 We met this Australian monk while there and had a fascinating five-minute chat before the ceremony began. The monks began chanting. It is a slightly hypnotic, nasally sound that I rather like. It can get monotonous when it goes for hours but I find it relaxing and enjoyable in short bursts. 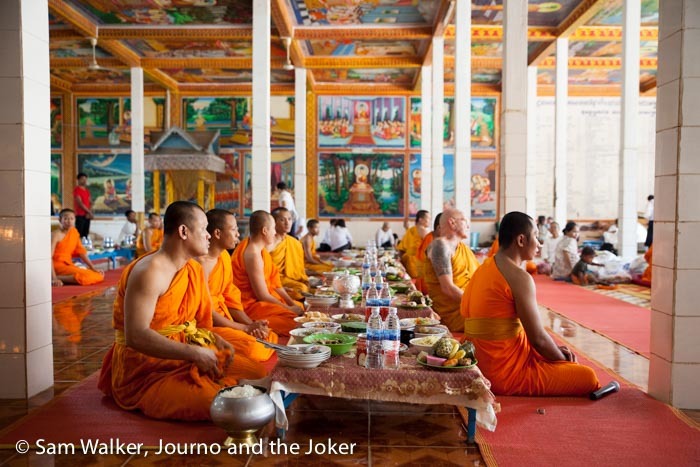 People prayed during this period and then food was served – to the monks and to those giving offerings. Phchum Ben is as important to Cambodians as the Khmer New Year celebration. Families visit the pagodas together. They spend many hours cooking up food to take and the pagodas are busy during the mornings. Phchum Ben is a two-week festival, usually in September or October and the last three days are the most important. If you visit Cambodia during Phchum Ben, it is a great opportunity to witness a cultural and religious celebration at the temples. While you can just wander in to the temples, it is useful to have a Khmer person with you so you understand what is going on. Be aware that it is a temple and it is important to dress accordingly – no skimpy shirts, skirts or shorts and no singlets. You also must make sure that your feet don’t point at the monks. It is also important to be aware that many places close during Phchum Ben, including the markets and some of the popular restaurants in town. 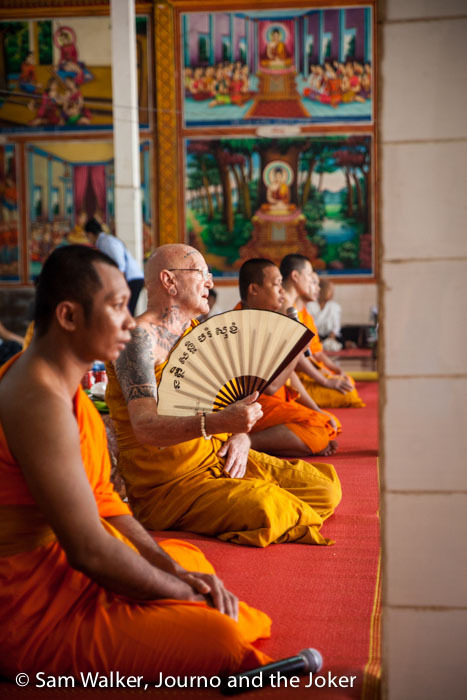 Have you been to Pchum Ben or been part of a religious or cultural event in another country? Share your story with us. Great pictures, thank you for sharing. We have something very similar in Thailand. Thanks for stopping by Joe and Siri. I’ve been told there is a similar kind of festival honouring the ancestors in China as well. I imagine there are many commonalities throughout this part of the world. Did you do take part in the festival in Thailand? These photos are lovely – what a unique experience! I hope to travel there someday! I hope you do Kate. You will love it. So many to take in. Great shots! I love the contrast of colours and the stories behind them really help bring them to life. I bet the guy with all the tattoo’s has a pretty incredible story to tell! Thanks Kevin. And yes, Charlie Kim has a great story. I went back and interviewed him. Stay tuned for his post.